We have invited International Princess Project to join us for both Advance Screenings of MOTHER INDIA: Life Through the Eyes of the Orphan on June 6th and 8th, 2012, in Orange County, California, in order to make their beautiful Punjammies available for purchase. IPP is a non-profit organization that empowers women formerly enslaved by prostitution to restore their lives. The mission of International Princess Project is to advocate for women enslaved as prostitutes, restore their broken lives, and empower them to live free. Currently, they achieve their mission through providing vocational training and dignified work for women escaping lives of forced prostitution. This includes the opportunity to support themselves vocationally, to heal in body and spirit, and to live lives of freedom. They strive to raise awareness about human trafficking, empower people to rise up with financial support, and action to help bring an end to forced prostitution worldwide. Purchase Punjammies and not only will you get some beautiful pajamas great for lounging or sleeping, you will empower women with dignity and hope. After discussion with a number of artists, we are proud to announce that Rebecca St. James will be narrating MOTHER INDIA: Life Through the Eyes of the Orphan. We’re excited to have an recording artist of her caliber lend her talent and voice to the initiative. Originally from Sydney, Australia, Rebecca rose to fame in the late 1990s with several albums including “Pray”, which won a Grammy Award in 1999 for Best Rock Gospel Album. Since the beginning of her career, St. James has sold a total of two million albums. Outside of her musical career, St. James is an accomplished author and actress. To date, she has released nine published books and starred in five films, and she is a spokesperson for Compassion International. With help from his brother Tim Foreman on bass and Chad Butler on drums, Jon formed the band Chin Up in 1996, and they soon changed the name to Switchfoot. The band recorded a debut LP, 1997’s The Legend of Chin, for Charlie Peacock’s re:Think imprint. The follow-up, 1999’s New Way to Be Human, was a huge commercial success in Christian markets, with the title track garnering a 1999 Dove Award for Song of the Year. Released in 2000, Learning to Breathe found Switchfoot moving more toward mainstream modern rock, and its success, along with the band’s inclusion on the soundtrack to the 2002 Mandy Moore film A Walk to Remember, brought Switchfoot a major-label run. The Beautiful Letdown, their first release for Columbia/RED, appeared in 2003. Thanks to the radio hits “Dare You to Move” and “Meant to Live,” the album went double platinum and hit number one on Billboard’s Christian Albums chart. Switchfoot’s fifth album, Nothing Is Sound, appeared in 2005 and almost immediately went gold. A sixth album, Oh! Gravity, appeared in 2006, and their seventh studio album Hello Hurricane received a Grammy award in 2011 for Best Rock Gospel Album. 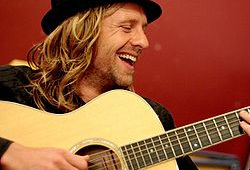 Learn more about Jon at www.jonforeman.com. As a kid Patrick was always interested in music and eventually attended Berkeley College where he was further educated in music. After moving to Los Angeles to do freelance work, he was invited to join Katy Perry’s band. Patrick said “I had about four days notice to learn all of the songs before flying to Portland for the first show. Because Katy was not feeling well for the rehearsals, the first time I played with her was on stage for the show.” Patrick currently plays lead guitar for Katy’s band, which is on tour to promote their new album. Follow Patrick on Twitter. Korel is a multi-instrumentalist, singer, and songwriter originally from Pittsburgh, PA. He went to Berklee College of Music in Boston, where he got a degree in Tenor Saxophone. In Boston, he also started playing guitar, singing, writing songs, and touring with the well established Boston band, Shockra. In 2001, Korel also won an endowment from the Pittsburgh Cultural Trust, a Creative Achievement Award grant, as an Emerging Artist. Moving to Los Angeles, in 2003, Korel began a new round of very diverse musical adventures. His first tour out of L.A. was in 2004 playing keys with Mississippi songwriter, Charlie Mars. The next year he took a 180 degree turn and played guitar with Actress Jada Pinkett-Smith’s Metal band, Wicked Wisdom. They recorded an album and toured on Ozzfest in 2005. 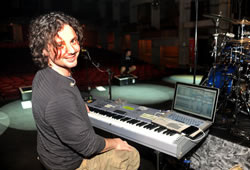 In 2006, Korel started playing keys, guitar, sax, and singing with The Goo Goo Dolls for the tour supporting their album, “Let Love In.” Korel toured internationally with them for 3 years, performing on dozens of television shows such as Jay Leno, (several times with the Goo Goo Dolls and another with Papa Roach), Conan O’Brian, Live from Abbey Road, and various morning shows. In late 2008, Korel joined up with Katy Perry’s band to be the live house band as she hosted the European Music Awards in Liverpool, England. He then toured with Katy through 2009, playing guitar, keys, sax and vocals. They went around the world several times, played on the 2009 Grammy Awards, and many television shows, such as The Today Show, Ellen, and a number of international shows. In September 2009 Korel returned to The Goo Goo Dolls and joined in with vocal harmonies and keyboards on their new record, “Something For The Rest Of Us.” Learn more about Korel at www.koreltunador.com. 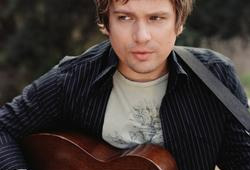 Sean is a guitarist, vocalist, and songwriter as a member of the contemporary folk band Nickel Creek, the duo Fiction Family, and the supergroup Works Progress Administration. Nickel Creek has released three albums and a CD composed of their hits (called Reasons Why: The Very Best) and won a Grammy for This Side — a coveted trophy that Watkins reportedly put on top of his toilet at home. Explaining the somewhat odd situation, Watkins said that “it seems like a humble place. I didn’t want to put it out in plain view of my house. I didn’t feel like displaying it right when you walk in. It’s a nice crown for the porcelain.” In addition to playing with Nickel Creek, Watkins has released 3 solo albums and appeared on several others. Watkins’ solo music career seems to reflect Nickel Creek’s: turning from traditional bluegrass songs to indie rock with bluegrass instrumentation. Learn more about Sean at www.seanwatkins.com. 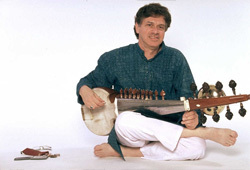 David has studied sarode perfomance and North Indian classical music under maestro Ali Akbar Khan, India’s ‘Living National Treasure,’ since 1973. He holds a Ph.D. from the University of California, Santa Barbara, and an M.F.A. in music from California Institute of the Arts. David has appeared in concert in arts centers, universities, conservatories and festivals in the United States, Europe, and Asia, and has made numerous per forming tours in India. In 1997 he and David Philipson were selected to perform for The Music Circle in Los Angeles; the first western performers of North Indian music to be so invited. In 2003, David provided the on-screen music for the popular and widely acclaimed film Leela, diected by Somnath Sen. In 2012, he was named the Gordhan L. and Virginia B. “Jinx” Patel Distinguished Visiting Professor in Indian Music Arts at the University of Georgia Hugh Hodgson School of Music. Learn more about David at www.davidtrasoff.com. 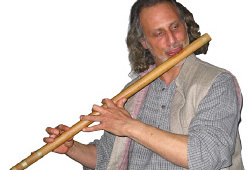 David began studying Indian classical music in 1978 at California Institute of the Arts with Amiya Dasgupta and Taranath Rao, where he received his BFA and MFA in music. In 1984 he was awarded a Fulbright grant to study in India with the leading exponents of the late Pt. Pannalal Ghosh lineage of bansuri performance; V.G. Karnad, Devendra Murdeshwar and Nityanand Haldipur. Philipson has also received guidance from Ali Akbar Khan, Ravi Bellare and Rajeev Taranath. Philipson has performed extensively in the US, Europe and India. In 1997 he and David Trasoff were selected to perform for The Music Circle in Los Angeles; the first western performers of North Indian music to be so invited. In addition to many recordings, he can be also heard on the film scores of Xena:Warrior Princess, ‘Man from Elysian Fields’, ‘Perfumed Garden’, ‘Leela’ and ‘Outsourced’. Learn more about David here.